A passenger using an electronic cigarette led to armed police swooping on a coach in a terror alert which closed the M6 Toll in Staffordshire for more than four hours. 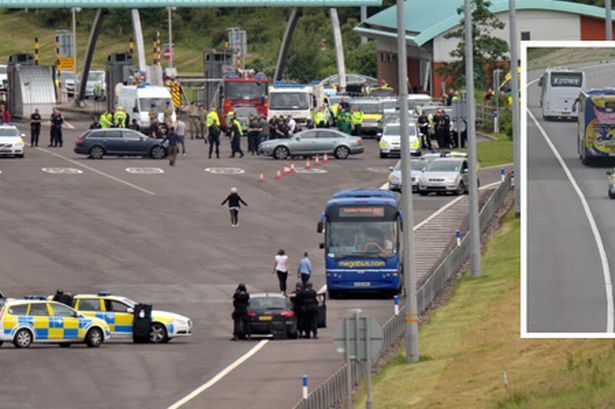 Passengers leave the coach at the M6 Toll. Inset: The coach is escorted away. Armed officers, troops, firefighters and bomb disposal experts all went to the scene on the M6 Toll at Weeford, near Lichfield, after a passenger reported seeing vapour coming from a man&apos;s bag. A decontamination unit was set up and passengers were searched and held in a makeshift pen on the carriageway, but police found no crime had been committed. The man was simply using an electronic cigarette, rather than the real thing, on the six-hour Megabus journey from Preston to London. With the Olympic Games, considered an attractive target for potential terrorists, starting later this month, police have urged the public to remain vigilant and report any suspicious activity. Officers responded "swiftly and proportionately" to "a genuine report from a member of the public", a Staffordshire Police spokeswoman said. "The information received concerned a report of vapour escaping from a bag which on investigation turned out to be a health improvement aid for smokers." Police later confirmed the device was an electronic cigarette which gives off a visible vapour. "We can now confirm that, whilst this was a genuine security alert, the significant concerns reported to us were unfounded," the force spokeswoman said. "It&apos;s important to state that no criminal offence has been committed and no passenger or any other member of the public is being treated as a suspect. "Our utmost priority was the safety and security of the public and whilst on this occasion the incident was resolved peacefully without event, we want to encourage the public to remain vigilant and report any suspicious activity. "We would like to apologise for any inconvenience and hope that the public understand that we have our duty to safeguard public safety." Police received a report at about 8.20am from "a genuinely concerned member of the public" who saw vapour coming out of the bag as the coach was near the M6 Toll plaza.. The incident shut the M6 Toll road in both directions between junctions JT3 and JT4 for more than four hours. Armed police officers led the passengers off the vehicle one by one and later searched them. The passengers, including at least one young boy, were taken to a cordoned-off area of the motorway and surrounded by police. Military personnel, police dog handlers, firefighters and other specialist units were also at the scene. A spokeswoman for Megabus, which is operated by Stagecoach, said 48 passengers were booked on the service and all were safe and well. "We are assisting police with their inquiries into an allegation made against a passenger who was travelling on the 05.10 Preston to London service," she said. "There were 48 people booked to travel on board the service, which was due to arrive at Victoria coach station in London at 10.55am. "Police have confirmed that all passengers are safe and well and they have been transferred to a substitute vehicle. "We are making arrangements to provide onward travel for passengers as soon as we receive clearance from the police." Eyewitness Nick Jones, who was stopped on the motorway for more than an hour and a half, told BBC News that police warned him to stay in his car, keep his windows closed and not to use air conditioning. "I was beginning to feel a little uneasy," he said. "I was beginning to look around for an escape route."